San Diego, CA– March 26 – IT Brand Pulse, a trusted source for research, data and analysis about data center infrastructure, today announced the results of its February 2015 IT brand leader surveys covering 12 product types. IT Pros from around the world responded to the independent, non-sponsored surveys, and were asked which vendors they perceive as the leader in the following categories: FCoE Switches, Ethernet Core Switches, Ethernet Top of Rack Switches, Enterprise Ethernet NICs, Ethernet Network Monitoring, Embedded Blade Server Networking, SDN Platform, SDN Enabled Switches, Layer 4-7 NFV Services Platform, SDN Monitoring, Bare Metal Switch OS, and Open Networking Switch. IT professionals were also asked who they thought contributed most to Innovation over the past five years in NFV and Bare Metal Switches for the enterprise. Cisco once again is the leader in the annual networking surveys by capturing Market Leader titles in five categories: FCoE Switches (sixth straight year), Ethernet Core Switches (fifth time), Ethernet Top of Rack Switches and SDN Enabled Switches (both for second year in a row), and took over the lead for SDN Platform. In every one of these product categories (except FCoE Switch), Cisco was named the overall winner for Market, Price, Performance, Reliability, Service & Support and Innovation. For FCoE Switches, IT pros chose Cisco for the Performance and Service & Support honors while splitting the votes with runner-up Brocade, who earned top awards as Price, Reliability and Innovation Leader. HP came in the third Market Leader spot. For Ethernet Core Switches, Brocade turned in a distant second place Market Leader finish, followed by Juniper; and Ethernet Top of Rack Switch results showed Brocade again in second with Dell/Force10 right behind as Market Leader. 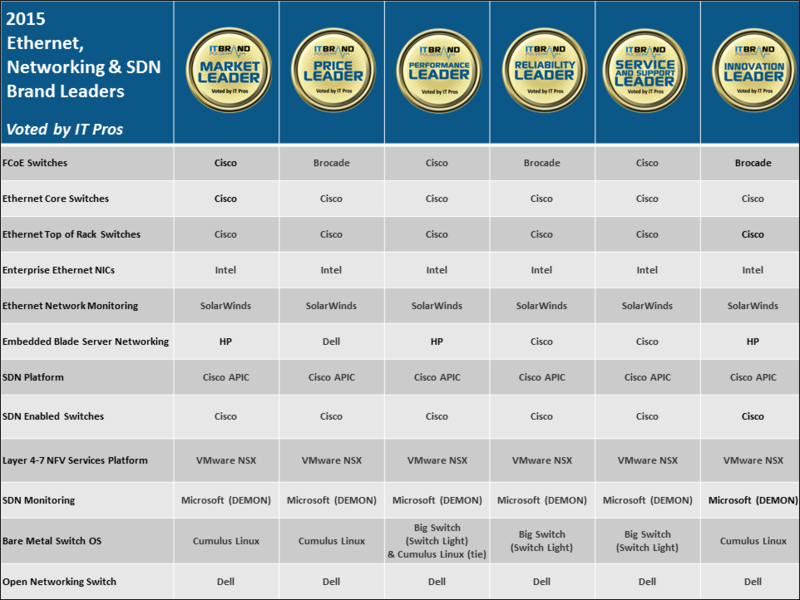 In the SDN Enabled Switch category, Cisco led the way as Market Leader with HP and Brocade coming in second and third, respectively. For SDN Platform, Juniper secured number two, with a three-way tie for third: Brocade, HP and IBM. Dell extended its reach to a first-time brand survey for Open Networking Switch by being selected as Market, Price, Performance, Reliability, Service & Support and Innovation Leader. Dell beat out second-place Quanta/IW Networks, along with Alpha Networks, who was third for the Market Leader award. Cumulus Networks won its first-ever brand leader awards in yet another new survey product category: Bare Metal Switch OS. Respondents, however, divided the titles—Market, Price and Innovation to Cumulus Networks; Reliability, Service & Support to Big Switch; and Performance results showed a tie between both vendors. Big Switch was named the number two Market Leader, ahead of Pica8. SolarWinds managed a three-peat sweep for Ethernet Network Monitoring: Market, Price, Performance, Reliability, Service & Support and Innovation. Like last year, Cisco was the runner-up selection for Market Leader— this time ahead of HP—who was third. Microsoft’s DEMON was another back-to-back sweep victor for SDN Monitoring by taking the Market, Price, Performance, Reliability, Service & Support and Innovation Leader awards. Gigamon’s Visibility Fabric slipped in behind Microsoft as the Market Leader, followed by Big Switch’s Big Tap. HP regained the Market Leader title it won in 2012 and 2013 for Embedded Blade Server Networking as 2015 respondents chose them ahead of last year’s winner, Cisco. While HP also emerged with Performance and Innovation awards, Cisco earned Reliability and Service & Support, and Price Leader went to Dell (who was number three in the Market voting). Intel, for the fourth year in a row, was the IT pro Market Leader pick in Enterprise Ethernet NICs and was voted Price, Performance, Reliability, Service & Support and Innovation titles. QLogic and Emulex finished two and three, in that order. VMware came up with the Layer 4-7 NFV Services Platform win for the third straight time and was the leader across the board: Price, Performance, Reliability, Service & Support and Innovation. Brocade and Cisco tied for the runner-up Market position. IT professionals also answered two bonus questions added to last month’s survey. The first, “Who contributed most to Enterprise NFV Innovation over the past five years?”, showed VMware as the choice for this special Innovation Leader achievement with Cisco in second. For the second question, “Who contributed most to Enterprise Bare Metal Switch Innovation over the past five years?”, the winning votes came in for Cumulus Networks, followed by Big Switch. IT Brand Pulse awards are the symbols for brand leadership. Winners are voted by IT pros in surveys that are independent, non-sponsored research. The surveys are designed to measure the pulse of brand leadership in specific product categories. Within each product category, respondents choose the overall market leader, as well as the leader in price, performance, reliability, service and support, and innovation. Respondents are provided with a category description at the start of each product section, a randomized choice of vendor answers, and the ability to write-in a vendor, if not listed. Respondents to our surveys have included (select list): AT&T – Server Administrator/Architect; Blue Cross Blue Shield Association (BCBSA) – Storage Administrator/Architect; Boeing – Data Center Manager; Booz Allen Hamilton – Network Security Architect; CalPERS, State of CA – Network Administrator/Architect; Caterpillar – Server Administrator/Architect; Citigroup – Network Administrator/Architect; City of Los Angeles – IT Manager/Director; Delta Airlines – Server Administrator/Architect; Duke University – IT Manager/Director; EarthLink – Server Administrator/Architect; Environmental Protection Agency – Network Administrator/Architect; ExxonMobil – Network Administrator/Architect; Fermilab – Network Administrator/Architect; Ford Motor Company – Network Administrator/Architect; GE – IT Manager/Director; General Dynamics – Network Administrator/Architect; General Motors – Server Administrator/Architect; Johns Hopkins University Applied Physics Lab – IT Manager/Director; JP Morgan – IT Manager/Director; Lockheed Martin – IT Manager/Director; Los Alamos National Lab (LANL) – Network Administrator/Architect; Lowe’s – Storage Administrator/Architect; Mattel Inc.- IT Manager/Director; Morgan Stanley – Network Administrator/Architect; NASA – IT Manager/Director; National Geospatial Intelligence Agency (NGA) – Network Administrator/Architect; National Oceanic and Atmospheric Administration (NOAA) – IT Manager/Director; Northrop Grumman – Network Administrator/Architect; Oppenheimer – Executive/Management; PepsiCo – Storage Administrator/Architect; Porsche Cars North America – Network Administrator/Architect; REI – Server Administrator/Architect; Sandia National Labs – Network Administrator/Architect; Shell – Storage Administrator/Architect; Social Security Administration (SSA) – Server Administrator/Architect; Stanford University – Network Administrator/Architect; Staples – Network Administrator/Architect; Target – IT Manager/Director; The University of Chicago – Server Administrator/Architect; Thomson Reuters – Server Administrator/Architect; T-Mobile – Data Center Manager; Transamerica – Storage Administrator/Architect; UBS – Executive/Management; UCLA – IT Manager/Director; United Airlines – Network Administrator/Architect; Universal Parks and Resort – IT Manager/Director; University Of Michigan- Data Center Manager; University of Michigan Medical School – IT Manager/Director; University of Notre Dame – Storage Administrator/Architect; USC – Network Administrator/Architect; Verizon – Network Administrator/Architect; Yale University – IT Manager/Director…among many others.